Fertility Road showcases the views of five of the industry’s leading experts in answering reader questions. The five experts we’ve invited to contribute are David Ogutu (fertility specialist at Herts & Essex Fertility), Kate Brian (renowned and widely published fertility author), Marisa Peer (Amazon bestselling hypnotherapist), Lucy Miller (leading fitness and nutrition writer) and Sir Robert Winston (professor, scientist, medical doctor and TV fertility expert). 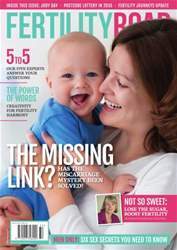 If you wish to submit a question for consideration in the next issue, please email editor@fertilityroad.com. Q: We’ve been trying for a second child for a while now, without success – I never thought this would happen given the ease with which my wife fell pregnant with our first child, Tim, and I’m worried we might be falling into the secondary infertility bracket. Should we keep trying? When you’re already a parent, you don’t expect to have difficulty getting pregnant but at least one in 10 parents will find it hard to conceive again. It’s a subject that is rarely discussed and it often comes as a real shock to parents to discover that they are experiencing what is known as secondary infertility. FROM SPERM DONOR TO… HUSBAND? IT’S ABOUT SO MUCH MORE THAN FOLIC ACID.